The Charfield railway disaster is said to be a disastrous train crash that had taken place in 1928 on 13 October in the village of Charfield in the English county of Gloucestershire. In the early hours of that fateful day, the night mail train from Leeds to Bristol had crashed beneath the road bridge at Charfield station. gas cylinders which were used in lighting the carriages and the fire had been so severe that those who had met their fate had been badly decomposed wherein their relative had to accept the offer of the railway company of a mass grave, which is noticeable in a corner of the village churchyard till date. It is on the memorial stone that the mystery prevails, that after recording 10 names together with their places of origin, it tends to end with `Two Unknown’. However in spite of various theories of the true identity, they seemed to be yet unknown. The Western Daily Press has launched an appeal to anyone who would be capable of eventually revealing the mystery which had shrouded the crash for decades,as the 80th Anniversary of the tragedy tend to draw near. Over 50 passengers had been on the train on that fateful night when it headed towards Charfield at around 5.30 am in thick fog. Henry Button had accepted the train from the Berkeley Junction and had put the distant signal to danger, according to some sources which should had stopped the express till a freight train had retreated into sidings. Unfortunately driver Henry Aldington and his fireman, Frank Want had read the distant signal as a clear one rather than of danger and went ahead which ended in a calamity. The goods driver had nearly cleared the line when he noticed the mail train coming down on him and the express crashed into the goods tender, ploughing off the line, hitting another empty goods train head on. One of the coaches had been thrown over the bridge that had crossed the line though worse seemed to follow. 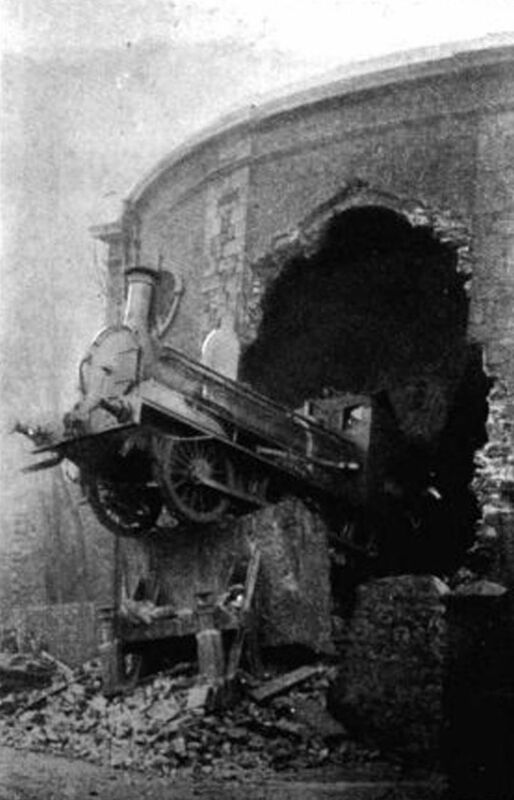 The express’ engine had fallen on its side among the splintered wagons where hot ashes had scattered from the firebox surrounding the line. Gas that has powered the lights in the coaches had escaped from the supply pipes which had been broken due to the impact and as they came in contact with the hot ashes it had turned the worn-out coaches into an inferno. Surprisingly the driver and fireman seem to survive from the ordeal and together with the villagers woke up by the noise of the crash. Passengers who had climbed clear had made great efforts to save those who had been trapped by the inferno. Within a span of 20 minutes, the flames had leapt by 50 feet high above and rescuers had managed to bring down the fire. Firemen had come from Bristol, Gloucester and Stroud who combatted with the blaze for five hours before eventually bringing it under control. However, it was many hours thereafter when they could search through the smouldering wreckage and recover the bodies of those killed. In total there were 15 people who had died and 23 who had been severely wounded.